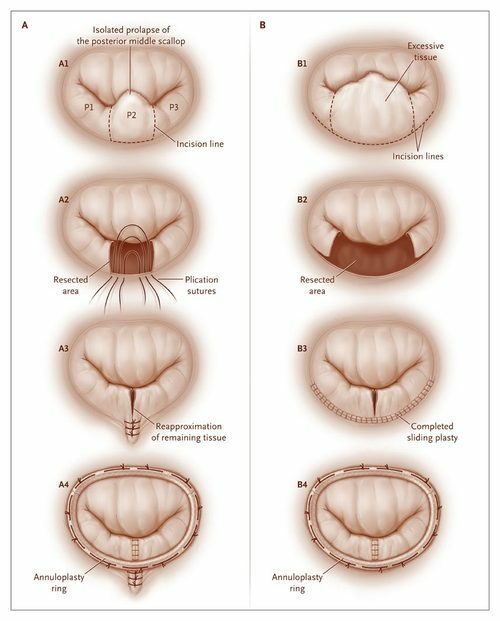 The advent of minimally invasive mitral valve repair techniques and their application through a minimally invasive approach mark two major milestones in the history and evolution of mitral valve repair and surgery. These techniques are now routinely applied to the majority of patients affected by mitral valve disease with excellent functional and cosmetic results. Both malfunctions can often be present in the same mitral valve. The following diagrams show you how the heart and its valves create forward flow of oxygenated blood in our circulation and what happens if the mitral valve is malfunctioning. The left side of the heart works with two one way valves. The first two pictures show you the normal valve mechanisms. In the first picture the heart relaxes and fills up with oxygenated blood, the mitral valve is open to allow blood in the left ventricle and the aortic valve is closed. In the second picture the heart contracts and the aortic valve opens to let the blood out into the aorta (the main pipeline). The mitral valve is closed to prevent the blood from leaking back into the left atrium. The third picture shows what happens with Mitral Valve Stenosis. The most common cause of mitral valve stenosis is rheumatic heart disease. Following a bout of rheumatic fever the mitral valve can be affected by chronic inflammation. The valve leaflets are “stuck” together because of gradual scarring that makes the valve opening too narrow to allow enough blood flow into the left ventricle. This flow impediment causes a pressure back up in the lungs. This “plumbing problem” explains what happens to patients with advanced mitral stenosis– their energy levels are very low (not enough blood flows through the body) and even a small amount of physical exercise will congest their lungs (because of the back up!) and give them severe shortness of breath. As you can imagine, these patients’ lifestyles are very limited. The stuck valve leaflets can be separated surgically (commissurotomy). In third world countries where this pathology is very common and the financial means are much more limited than in the U.S., the heart surgeons still use an old but inexpensive technique. It consists on inserting a finger through the valve to pry it open without stopping the heart. Most American and European surgeons use an open heart technique that allows a precise valve repair or replacement under direct vision. In selected cases the valve opening can be enlarged by inserting a thin balloon-tipped catheter similar to the ones used for angioplasties. The balloon is then inflated across the valve to force it open. The choice of operative technique and type of repair or replacement is dictated by many factors. It is important to point out that each patient is in a unique situation that requires a tailored solution to his or her case. The fourth picture shows Mitral Valve Regurgitation. When the mitral valve does not close properly at each heartbeat, a part of the oxygenated blood in the left ventricle “leaks” back into the left atrium and the lungs instead of flowing forward. A severe degree of leakage makes the heart pumping action very inefficient and causes lung congestion. The most common symptoms associated with this condition are shortness of breath, generalized weakness, inability to endure even light physical exercise and, at times, chest discomfort and pain. One of the most common deformities we encounter in patients with a leaky valve is the Mitral Valve Prolapse. MVP is a very common condition and it tends to run in families. Recent statistical studies report a 5% incidence in the general population and up to 17% among young women (one out of six). Let’s see what it is: the mitral valve normally functions as a one-way valve and is made out of two leaflets of fibroelastic tissue that open and close like window shutters to direct the blood flow inside the heart. When one or both leaflets dilate and loosen up excessively, the valve does not function properly. The leaflets will acquire an abnormal amount of up and down motion which may cause the valve to “leak” because of an incomplete closure. Six patients out of ten affected by this condition have absolutely no symptoms. Physical and emotional stress (i.e. : a bad flu, a pregnancy, relocation or changes in the work environment) can at times be the cause of the first symptoms. The most common symptoms are palpitations, a fast heart rate, chest pain, panic attacks or sudden anxiety, extreme lack of energy, or headaches. A mitral valve prolapse can be often discovered by your physician with a simple physical exam and by listening to your heart with a stethoscope. When the heart contracts and pushes blood against these abnormally dilated valve leaflets a characteristic sound can be heard. Why? Well….think of the sound of a large sail distended by a sudden gush of wind. That sound is generated by the abnormal motion of the valve leaflets! An echocardiogram can confirm the diagnosis and show us the valve motion and degree of its leakage, if any. A regular follow up program with repeat echocardiograms is strongly recommended to identify those patients who develop a severe leakage. In a small percentage of cases the mitral valve is so distorted and malfunctioning that a surgical correction becomes necessary to prevent a progressive and irreversible damage to the heart muscle. With severe mitral valve regurgitation the heart tires out and can be irreversibly damaged unless a mitral valve repair is promptly performed before intense symptoms are present. Other elements that influence the early timing of corrective surgery are the enlargement of the heart in repeat echocardiograms and the onset of atrial fibrillation. An early mitral valve repair in a heart surgery center with solid experience in repair techniques is currently the best choice. When the valve is repaired patients can enjoy the clinical benefit of a more natural solution (keeping their own functioning mitral valve) while avoiding the disadvantages of a replacement with artificial valves. The repair technique consists of fine tailoring of the defective valve followed by the insertion of a ring around it to prevent subsequent changes in valve size and shape. The following diagrams will give you a more detailed rendition of the most common repair techniques we use in our patients. Our minimally invasive mitral valve repair and heart surgery techniques allow us to repair or replace these defective valves reliably and through a small chest wall incision, with less pain and bleeding, a quick recovery and excellent cosmetic results. In most women the surgical incision can be actually hidden underneath the breast. Oftentimes a floppy mitral valve can be repaired rather than replaced, avoiding altogether the need for blood thinners and decreasing the chance of embolic events (i.e. : strokes) more commonly seen if a valve replacement with a mechanical valve is performed instead of a repair. Patients with significant mitral regurgitation (leaky valve) should be aggressively evaluated and followed up to decide if and when they need a surgical correction that could dramatically improve their quality of life and longevity. The following is a surgical video to illustrate some of the techniques applied in minimally invasive mitral valve repair. Eugene Grossi, MD et Al. Minimally Invasive Versus Sternotomy Approaches for Mitral Reconstruction: Comparison of Intermediate-Term Results. J Thorac Cardiovasc Surg 2001;121:708-13. The conclusion in this paper is that the minimally invasive approach for mitral valve reconstruction provides equally durable results with marked advantages for the patient and should be more widely used. Casselman FP, et Al. Mitral Valve Surgery can now routinely be performed endoscopically. Circulation 2003;108 Suppl 1:1148-54. This study on minithoracotomy mitral valve surgery patients reports that approximately 99% of patients thought that their scar was esthetically pleasing. Dogan S. et Al. Minimally Invasive Port-Access versus Conventional Mitral Valve Surgery: Prospective Randomized Study. Ann Thorac Surg 2005;79:492-8. A significant decrease in the amount of postoperative bleeding is demonstrated in the minimally invasive group compared with the conventional group. The success and durability of a mitral valve repair depends heavily on the surgeon’s experience in repair techniques. I am often consulted by patients who had a mitral valve repair elsewhere and then present again with the same severe mitral valve leakage they had before surgery. The main question I am asked is whether or not the mitral valve can be re-repaired. Here is the good news: in experienced hands most valves can be successfully revised with no need for a replacement. There are several technical reasons why a mitral repair fails. An experienced mitral surgeon will be able to identify what caused a recurrent mitral regurgitation by examining a detailed echocardiographic examination. The rest of the assessment is then carried out at the time of surgery, directly on the valve. Most redo operations can be performed through a minimally invasive approach via a right sided minithoracotomy. Redo patients can often enjoy the quicker and more comfortable recovery afforded by these less invasive techniques and, more importantly, the advantage of a good repair over a replacement. Less experienced heart surgeons will have a very low threshold to perform a mitral valve replacement because they do not feel confident that a redo mitral valve repair will work in their hands. Again, it is very important to consider even traveling out of state or town to be treated by an expert mitral surgeon. It is definitely worthwhile and the benefits of that choice will last a lifetime. The following surgical video shows a redo mitral valve repair for recurrent mitral regurgitation secondary to a partial detachment of the annuloplasty band inserted at the time of the first repair. Minimally invasive methods have many benefits over traditional surgery, including a nearly invisible scar, quick recovery time, bloodless options, and significantly improved quality of life post-surgery. Hear more about your options and what minimally invasive heart surgery can do for with in a consultation with Dr. Ciuffo. Request your consultation online or by calling (330) 363-1341.